Many of you will be celebrating Christmas in Florence and seeing your questions on our forum, we know you want to know what to do – and what you can do – particularly on December 25 when all museums will be closed. Did you know that December 26 is also a national Italian holiday? 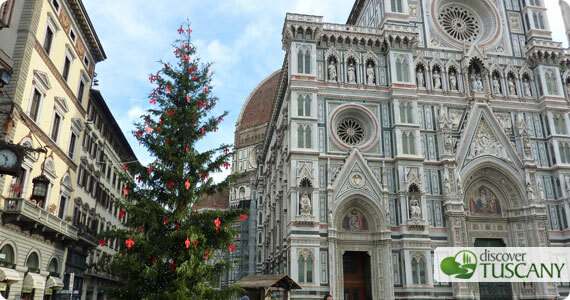 If your time is limited in Florence and you were set to visit some museums, definitely fit those in on Christmas Eve. All museums will be open, although most of the state museums will be closing about an hour earlier than usual, including the Uffizi and Accademia. All museums will be closed on Christmas Day except for the Palazzo Medici Riccardi – if you’ve never been inside the small Chapel of the Magi to see the frescoes by Benozzo Gozzoli, we highly recommend a visit – its a beauty! Just because the museums and shops are closed doesn’t mean there is nothing to do – Florence is truly an open-air museum! Take advantage of this day to stroll around the entire historical center. Here is a suggested itinerary: start from the north from Piazza San Marco heading down to Piazza San Lorenzo, then to Piazza del Duomo, down Via Calzaiuoli to Piazza della Signoria. Continue down past the Uffizi Gallery to Ponte Vecchio and to Palazzo Pitti. If you still have energy, climb up to Piazzale Michelangelo to enjoy the extraordinary view of Florence you can have from here. What else will be open on Christmas day? A few churches will be open for visits for a few hours in the afternoon (since most of the day will consist of religious services): you can head to San Miniato al Monte, Santa Maria Novella, Santa Trinità and Santo Spirito. Of course, you can go into any of the churches during the day but only if you want to stay and listen to the service, they won’t allow anyone interested in visiting to roam about (this particularly applies for the cathedral which is closed for visits). Monday December 26 is Boxing Day, or Santo Stefano as it is known in Italy. State museums that are usually open on Mondays will be open on this day, including the Accademia and Uffizi, the Medici Chapels, Palazzo Vecchio and Santa Maria Novella museum. Also open: the Opera del Duomo museum, San Lorenzo church and museum and all of the monuments in Piazza Duomo (tower, cupola, baptistery, cathedral).